My work is currently focused on statistical machine translation (video), but more broadly defined, my interest is to make use of the vast amount of information that is available in digital form. My book on statistical machine translation is now available from amazon.uk and amazon.com . More on the Statistical Machine Translation Group here. Come and join our weekly meeting! Starting January 2014, I will be mainly at Johns Hopkins University, but remain affiliated with the University of Edinburgh. Data Intensive Linguistics, Spring 2006. Interactive translation prediction versus conventional post-editing in practice: a study with the CasMaCat workbench, Germán Sanchis-Trilles and Vicent Alabau and Christian Buck and Michael Carl and Francisco Casacuberta and Mercedes García-Martínez and Ulrich Germann and Jesús González-Rubio and Robin L. Hill and Philipp Koehn and Luis A. Leiva and Bartolomé Mesa-Lao and Daniel Ortiz-Martínez and Herve Saint-Amand and Chara Tsoukala, Machine Translation, Volume 28, Number 3-4, pages 217-235, 2014. Integrating an Unsupervised Transliteration Model into Statistical Machine Translation, Durrani, Nadir and Sajjad, Hassan and Hoang, Hieu and Koehn, Philipp, Proceedings of the 14th Conference of the European Chapter of the Association for Computational Linguistics, volume 2: Short Papers, 2014, pdf, bib Interactive translation prediction versus conventional post-editing in practice: a study with the CasMaCat workbench, Germán Sanchis-Trilles and Vicent Alabau and Christian Buck and Michael Carl and Francisco Casacuberta and Mercedes García-Martínez and Ulrich Germann and Jesús González-Rubio and Robin L. Hill and Philipp Koehn and Luis A. Leiva and Bartolomé Mesa-Lao and Daniel Ortiz-Martínez and Herve Saint-Amand and Chara Tsoukala, Machine Translation, Volume 28, Number 3-4, pages 217-235, 2014. Using Feature Structures to Improve Verb Translation in English-to-German Statistical MT, Williams, Philip and Koehn, Philipp, Proceedings of the 3rd Workshop on Hybrid Approaches to Machine Translation (HyTra), 2014, [df, bib. The UEDIN Systems for the IWSLT 2012 Evaluation, Eva Hasler, Peter Bell, Arnab Ghoshal, Barry Haddow, Philipp Koehn, Fergus McInnes, Steve Renals and Pawel Swietojanski, International Workshop on Spoken Language Translation (IWSLT), 2012, . Monte Carlo Techniques for Phrase-Based Translation, Abhishek Arun, Barry Haddow, Philipp Koehn, Adam Lopez, Chris Dyer and Miles Osborne, Machine Translation Journal, Volume 24, Number 2, pages 103-121, 2010. Empirical Methods for Splitting Compound Words with Application to Machine Translation, Philipp Koehn, United States Patent 7711545, awarded 2010.
Review of Cyril Goutte, Nicola Cancedda, Marc Dymetman, and George Foster (eds): Learning machine translation, Philipp Koehn, Machine Translation Journal, 2009, volume 23, number 4, pages 269-271. A Uniform Framework for Phrase-Based, Hierarchical and Syntax-Based Machine Translation, Hieu Hoang, Philipp Koehn and Adam Lopez, International Workshop on Machine Translation (IWSLT), 2009, bib, pdf. 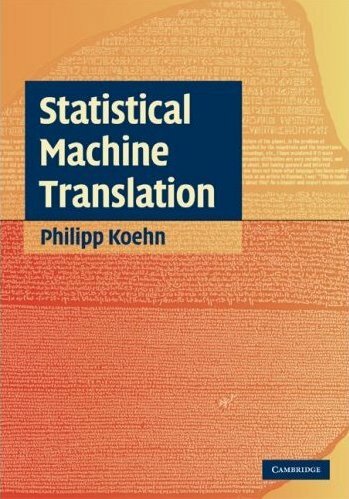 Statistical Machine Translation, Philipp Koehn and Kevin Knight, United States Patent 7624005, awarded 2009. Constructing a translation lexicon from comparable, non-parallel corpora, Daniel Marcu, Kevin Knight, Dragos Munteanu, Philipp Koehn:, United States Patent 7620538, awarded 2009. Phrase-Based Joint Probability Model for Statistical Machine Translation, Daniel Marcu, Kevin Knight, William Wong and Philipp Koehn, United States Patent 7454326, awarded 2008. Edinburgh System Description for the 2006 TC-STAR Spoken Language Translation Evaluation, Abhishek Arun, Amittai Axelrod, Philipp Koehn, TC-Star Evaluation Workshop, 2006.